Rochester is a yellow-fleshed peach with large fruit and good flavour. It ripens towards the end of July. 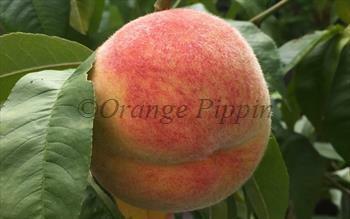 Growing peaches in the uncertain UK climate is always something of a gamble but Rochester is one of the most reliable. It should be ripe in early August - just ahead of time when Victoria plums are ripe. This is a free-stone peach, the stone falls away cleanly from the flesh. Please fill in the details below and we will let you know when Rochester peach trees are back in stock. Rochester is self-fertile and does not need a pollination partner, although fruiting may be improved if there is a compatible tree of a different variety nearby. Rochester is self-fertile, reliable, and easy to grow (at least by peach standards). It flowers relatively late, which means the blossom is less likely to be affected by late frosts. Rochester was raised by a farmer in New York state, USA in the early 1900s.